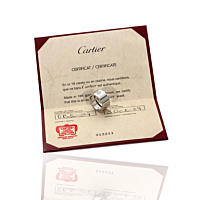 Cartier delivers big things in small packages with this 18k White Gold Love Diamond Ring. The ring possesses much of the same classic chastity-belt-inspired design made famous by the Love collection, but in a more annotated iteration and with a much more affordable price. Cute, luxurious, and extremely romantic - this exceptional ring more than lives up to the proud Cartier Love legacy!